The debate about insanity in criminal defenses has been raging for years, but did you know that it was raging almost 100 years ago? I didn’t – I thought that this type of defense was a relatively newer concept and was surprised to learn that I was wrong. 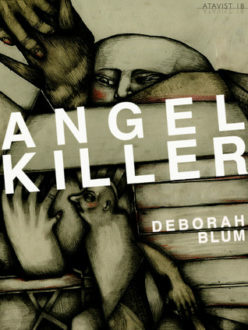 Angel Killer: A True Story of Cannibalism, Crime Fighting, and Insanity in New York City by Deborah Blum (a Kindle single that is free with Kindle Unlimited) is about Albert Fish, a man who kidnapped, murdered, and ate children during the 1920’s. He was an unassuming, grandfatherly-like man who easily gained the trust of the people he encountered and it was only after his arrest that those closest to him disclosed some of his strange habits that should have indicated some type of disturbance. The book is short – only 39 pages – and summarizes some of Fish’s kidnappings and murders and his subsequent trial. For the most part, the book only offers an overhead look at the man and his crimes, but there are some heartbreaking and gruesome details that are not for the faint of heart. What really struck me, though, were the book’s implications, so while it only skims the surface, it will leave you with much to think about. For example, the debate over what determines not guilty by reason of insanity. Although Fish had been evaluated for insanity prior to his murders, he was deemed sane and released back into society. The argument then was that the city did “not provide sufficient help to make a complete examination in every case,” which is still true today. In another parallel to the 1920’s, it was pointed out that most murderers were underachieving white men, not women. And, like today, tracking offenders was difficult. In fact, Fish had been arrested several times for non-violent crimes and his mugshot was on file but no one knew it. It was his arrest that was used as an example for why a centralized fingerprint database was necessary in order to track sexual predators. In closing, I will offer the following quote because it raises a good question that is relevant to today’s debate about mental health and criminal activity – would we prefer to see evil as evil or evil as a mental defect that could simply occur? The problem with calling an act evil rather than considering it an illness is that it often overlaps with the insanity issue and taints it…. If people decide that some behavior is ‘evil,’ they don’t want to believe that a mental defect was responsible; they want the evil person to be supremely punished. Recommended for: Anyone interested in a quick read that raises more questions than it answers.